Vente-Exclusive offers discounts on over 700 popular brands. Vente-Exclusive has “something new to sell every day,” as Product Manager, Wouter Cuypers puts it. The flash-sale online store leads the market in Belgium, the Netherlands, and Luxembourg. After each sale ends, Vente-Exclusive makes one big order from the supplier, then handles the logistics of shipping each order. The site runs three to six different sales each day. “Our chart [of sales and revenue] fluctuates every day, and it’s correlated with the brands we have on sale. And this makes analyzing data at Vente-Exclusive quite a challenge,” Wouter says. Two years ago, the business found itself overwhelmed with data. It had billions of data points on customer behavior, email campaigns, and shipping logistics, but it had no way to gain timely insights. Vente-Exclusive found a solution in Google Cloud Platform, a family of products on a pay-as-you-go model. “We immediately became interested in the various components of Google Cloud Platform that work very well together,” Wouter says. Google’s Cloud Storage provided unlimited data storage. Compute Engine enabled high-performance data processing. And BigQuery allowed for fast SQL queries of huge data sets. With just a few simple clicks, you can create compelling visualizations with analysis in no time. But even with this new data management architecture, Vente-Exclusive had a missing link: how to present the data to business users who don’t have any SQL knowledge? “First we wanted to do this in Excel, but that didn’t really work very well,” Wouter says. Under the Excel-based model, employees had to rely on the IT department, which managed the database and wrote queries to produce business reports. The process was slow, inflexible, and hard to maintain. Then Datatonic, a UK-based data architecture firm, recommended Tableau, which connects natively to BigQuery. Together, the pair addresses the full spectrum Vente-Exclusive’s big data needs. Google Cloud Platform stores and processes the data, and Tableau visualizes and shares the data for SQL-free analysis. “With just a few simple clicks, you can create compelling visualizations with analysis in no time,” says Wouter. 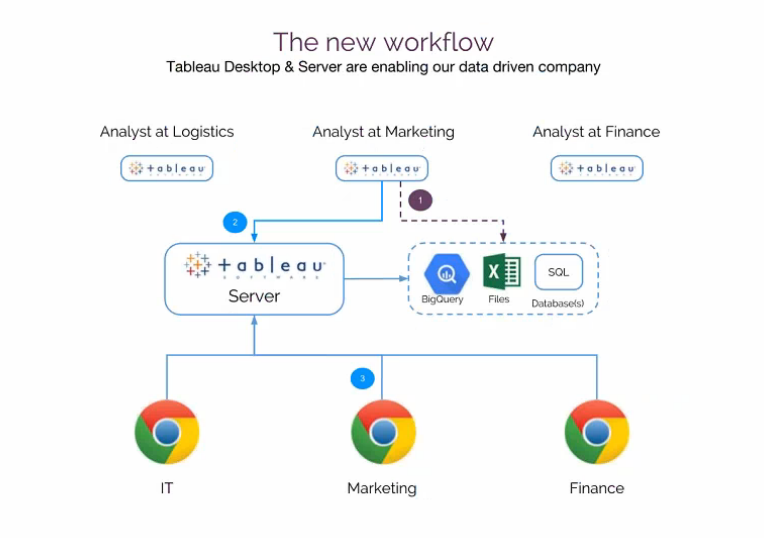 These days, Vente-Exclusive’s business analysts create dashboards using Tableau Desktop and share them via Tableau Server, which also connects to BigQuery to automatically refreshes data. The new workflow has eliminated “all the numbing work” of the old model, says Wouter. It has also empowered business users to make data-driven decisions. “Every employee should have the possibility of checking their own performance or the performance of their project. This is something that we truly believe in, and what we are trying to achieve,” Wouter says. This idea underpins both Cloud Platform and Tableau, says Karol. To learn more about Vente-Exclusive’s use of Tableau and Google Cloud Platform, watch our webinar.